Time and circumstances are favorable for Prime Minister Oli and the door to transform the country into a prosperous nation is right in front of him. CPN-UML Chairman KP Sharma Oli was appointed as 41st Prime Minister of Nepal on February 15. He succeeded Nepali Congress President Sher Bahadur Deuba to become the prime minister for the second time. He previously held top executive post from October 2015 to August 2016. An active leader of Jhapa Movement that brought him 14 consecutive years of imprisonment from 1973 to 1987, Oli has shared both good and bad experiences with Nepalis from the lower rung of the society. It is this sharing because of which his speeches are decorated with grievances and struggle of the marginalized people. Oli is a precise, articulate and effective leader. His second stint of premiership carries a greater significance. It is the first time the left parties have swept the landmark elections with clear majority in Nepal. In the past, communist leaders Manmohan Adhikari, Madhav Kumar Nepal and Jhala Nath Khanal led the government. Late Adhikari was the first democratically elected communist prime minister of Nepal. In 1994 elections, Nepali Congress secured 83 seats while UML had 88. Neither party was successful in forming a coalition to hold a majority of the 205 seats. However, Adhikari became prime minister of a minority government, acquiring the support from the National Democratic Party and Sadbhavana Party. His government was ousted in a vote of no-confidence nine months later. Similarly, Madhav Nepal (May 25, 2009 to February 6, 2011), Khanal (6 February 2011-29 August 2011) and Oli himself have led national consensus government that lived for a very short time. 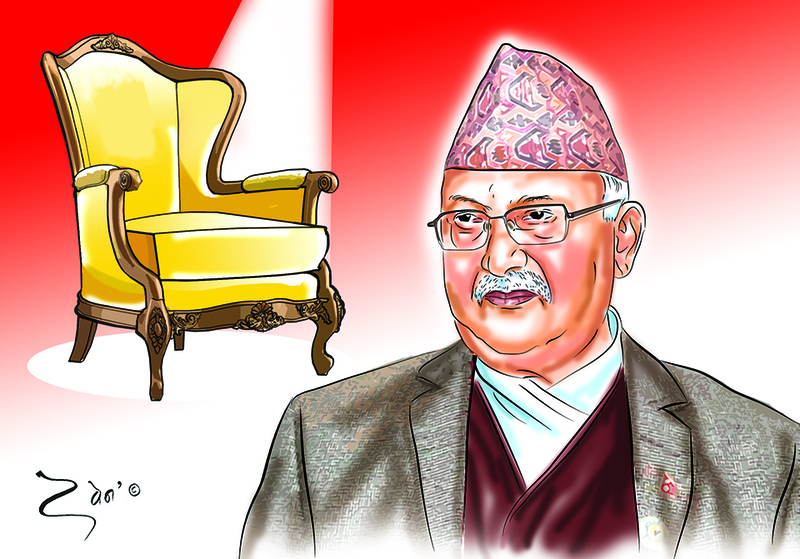 Since the left alliance has the clear majority (with 80 seats of UML and 36 of Maoist Center of total 165 seats), Oli has become a powerful prime minister. Besides people’s mandate, Oli has support from one of the most charismatic leaders of Nepal, Pushpa Kamal Dahal, Chairman of CPN (Maoist Center). On February 19, the two leaders reached a seven-point deal on party unification, which the two left parties have termed as the key primary basis for merger. The successful completion of all three tiers of election has paved way for constitution implementation. Even though Oli says prolonged transition in the country has come to an end, it is yet to see how he is going to lead the country. And, with people’s mandate of progress, development and economic prosperity on his shoulder, Oli has several challenges ahead. Since enjoying the comfortable majority in House of Representatives, the left alliance has got a strong foundation to lead the government for a straight five years. Time and circumstances are favorable for Oli and the door to transform the country into a prosperous nation is right in front of him. Several leaders have taken government leadership in the country. Some leaders remained disputed while others took risks to bring radical transformation. Widely regarded as one of the greatest political personalities of Nepal and staunch supporter of democracy, Bishweshwar Prasad Koirala’s ideology has always remained the source of intellectual energy for every Nepali, who keeps faith in democracy. BP Koirala is greatly respected by both Congress and the communist parties. Krishna Prasad Bhattarai was one of the main leaders involved in transitioning Nepal from an absolute monarchy to multi-party democracy. The 1990’s constitution was promulgated while he was the interim prime minister of Nepal. Manmohan Adhikari gave the message that a state should always work in the welfare of people. Girija Prasad Koirala had a greater role in concluding peace process. Nepal’s new constitution was promulgated when Sushil Koirala was prime minister. Oli was the home minister when Manmohan Adhikari was the prime minister of Nepal. He was deputy prime minister and foreign affairs minister when Girija Prasad Koirala was the prime minister. He was popular among both leaders. Oli certainly must have learned many lessons from these leaders. Oli has sharpened himself with the greater knowledge of world’s politics through practical studies rather than any academic degrees. He has every quality a statesman should possess. Thus, history will evaluate what Oli will offer to the country. PM Oli, in a dramatic turn of events, forged electoral alliance with Maoist Center on the eve of House of Representative and Province Assembly elections. This surprisingly turned the results in his favor, eventually bringing him to power. Moreover, when Oli was waiting in line for the top job, Indian External Affairs Minister Sushma Swaraj came to Nepal on a two-day visit. Though Swaraj stated that she had come to Nepal with no special agenda, her visit carried a strong message that India wants to cooperate with Nepal. 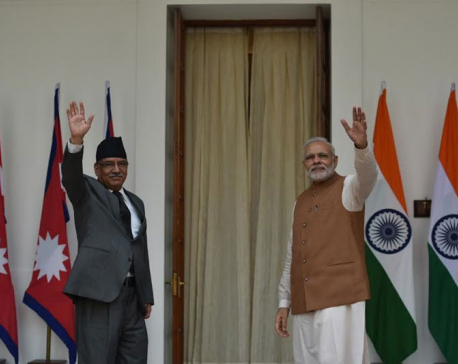 Before that, Indian Prime Minister Narendra Modi had held telephone conversation with Oli and said he was eager to welcome Oli in India. Oli also said that he wanted to cooperate with India. It can be expected that Oli, after assuming office, will make his first diplomatic visit to India. Indian Ambassador Manjeev Singh Puri’s role has been very crucial in further deepening the excellent Indo-Nepal bilateral ties. Ambassador Puri had repeatedly met Oli to boost the depth of Nepal-India ties and has been quite successful as well. Oli should be able to move ahead balancing the relation between India and China. Not only that, Oli has the capability to establish positive bond with America and European countries as well. If Oli can move ahead by properly maintaining foreign relations, huge foreign investments in Nepal won’t be far. For that, Oli should be able to give the message of political stability, peace and investment-friendly environment. Oli, now, is not only a leader of one party but country’s prime minister. Thus he should take decisions that are favorable to nation and people and lead the country toward progress, development, economic prosperity as well as good governance and corruption-free state. Nepali people have a lot of expectations from Oli. It is time for him to work in interest of people, while keeping in mind the people’s mandate, and establish himself as the statesman of the nation, not just the leader of his party.